Long-term drought and declining snowpack levels are stressing Arizona’s overgrown forests, not only leading to severe fire threat but also changing the water cycle. Now, new research by the Nature Conservancy and Northern Arizona University (NAU) has found that accelerated thinning of Arizona’s overgrown ponderosa pine forest will not only help forest health, but potentially yield more water from the forest to benefit the headwater streams and aquifers in the Salt and Verde river watersheds. The research, published in the online journal "Public Library of Science (PLOS ONE)," looked at the effects of forest thinning in Arizona’s Salt and Verde river watersheds. The study is based on the Four Forest Restoration Initiative, the largest forest restoration program in the U.S., which is attempting to increase the rate of forest thinning three-fold. Much of Arizona’s ponderosa pine forest is crowded with too many trees that are sucking up limited moisture. The research found that where forests are thinned, there are fewer trees using that moisture, allowing more water to runoff into streams. The research used a statistical model to demonstrate that yearly gains in runoff varied considerably depending on the amount of winter precipitation; in years with low winter precipitation, for example, gains would be negligible. Over the 15-year treatment period, however, cumulative increases in runoff ranged between 20% and 26%, producing significant benefits for headwater streams and aquifers and more modest benefits to downstream users. This additional runoff from thinning could help offset the 20% decline in snow pack levels that other research has predicted from climate change, according to the researchers. “Ponderosa pine forests in the Salt and Verde watersheds produce 50% of the runoff, yet they cover only 20% of those watersheds,” said Rob Marshall, director of the Nature Conservancy’s Center for Science and Public Policy. 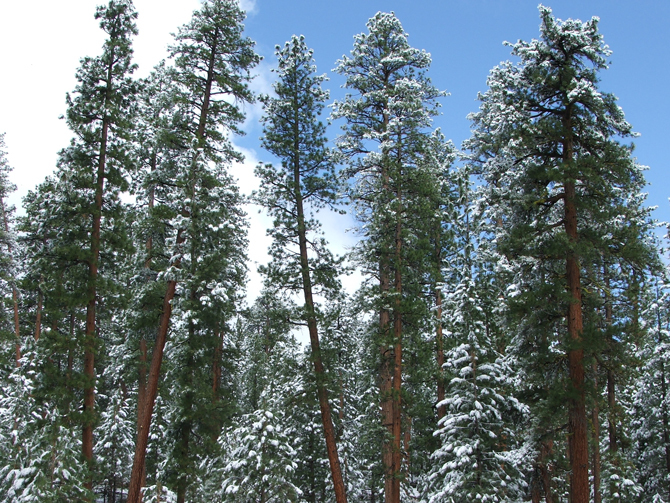 “The research reinforced the urgent threats to our ponderosa forests from drought and warming conditions and how thinning these forests will benefit both people and nature." The Verde River supplies much of the water to residents in the Verde Valley, and when combined with the Salt River, provides around 30% of the water for metropolitan Phoenix. “In an era of drought, any addition of water is going to help the river and communities dependent on this water,” Marshall said. "The [Nature] Conservancy-NAU research examined the rate, extent and intensity of the tree thinning. The results indicate that thinning reduces the competition for soil moisture so there’s more runoff,” said Nature Conservancy scientist Marcos Robles, the study’s lead author. The researchers extrapolated data from 30 years of U.S. Forest Service research starting in the 1950s. There are several differences between the early research and the current study. In the early research, the Forest Service linked tree harvesting to water measurements on a much smaller scale – 100 acres versus the current study that examined half a million acres. The current research also looked at the influence of climate variability “in a way that no one has done before,” said Robles. “We found that runoff gains would occur in both wet periods and droughts." Even though drought means less precipitation over a 10- to 20-year period, some years within that period – typically one out of three years – have above-average winter precipitation. These are the years that accounted for 75% of the water runoff gains in the study. Recent research has predicted reduced stream flow in the Salt and Verde watershed due to drought and warming, which would harm riverside and native fish habitat. The study noted that the benefits of thinning on runoff last up to six years. As the forest grows back, the runoff is reduced. This research did not address the question of whether followup treatments using fire or mechanical thinning would sustain increases in runoff. NAU plans a followup study to address these and other outstanding questions, according to NAU post-doctoral researcher Frances O’Donnell, who collaborated on the study. The Four Forest Restoration Initiative, which plans to thin more than 300,000 acres of Arizona’s forests in the next 10 years, plans to integrate fire or other treatments as a way to maintain forest health after thinning. In addition to increasing runoff, forest thinning will help restore health to the ponderosa pine forests in Arizona and reduce the risks of destructive forest fires. Thinning projects are the start of a recovery process, not the end point. “They will allow managers to hit the reset button on forest resilience, and are likely to have multiple benefits, not just for water, but to reduce fire risk and improve wildlife habitat,” Marshall said.